STEM Education has become a major topic of discussion in recent years. STEM stands for Science, Technology, Engineering, and Math – subjects associated with growing career opportunities in the U.S. However, the U.S. lags behind internationally in STEM Education, ranking 29th in math and 22nd in science among industrialized nations. 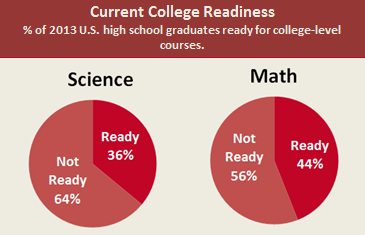 In fact, less than 50% of high school graduates in the United States are ready for college-level math or science classes, and even less of those qualified individuals are interested in a STEM career. 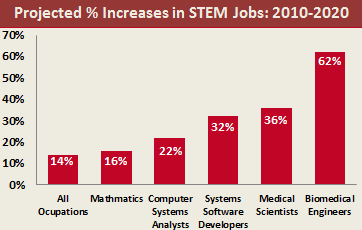 A lack of interest in STEM fields has become a big issue in the United States. Careers associated with these fields of study are rapidly on the rise, growing at a pace that far exceeds demand for non-STEM related careers, yet there aren’t enough qualified candidates to fill these roles. President Obama has taken notice of this huge disparity, and has placed an emphasis on developing qualified STEM professionals. He aims to develop, recruit, and retain 100,000 STEM teachers, and have an additional one million students graduate college with STEM majors over the next 10 years. To accomplish this goal, there will be an emphasis on improving STEM instruction in Pre-K through 12th grade. To improve instruction, schools will be providing more hands-on learning opportunities and engaging teaching methods, many of which incorporate mobile learning technology. This should help provide ample opportunities for resellers in the coming years, as schools will be expected to add more devices and infrastructure/accessories to support them.